Editor’s Note: Following are some excerpts from an extensive article published in New York Magazine. A link to the full article is provided following the article. The unfolding of the Russia scandal has been like walking into a dark cavern. Every step reveals that the cave runs deeper than we thought, and after each one, as we wonder how far it goes, our imaginations are circumscribed by the steps we have already taken. The cavern might go just a little farther, we presume, but probably not much farther. But what if that’s wrong? What if we’re still standing closer to the mouth of the cave than the end? What is missing from our imagination is the unlikely but possible outcome on the other end: that this is all much worse than we suspect.Suppose we are currently making the same mistake we made at the outset of this drama — suppose the dark crevices of the Russia scandal run not just a little deeper but a lot deeper. If that’s true, we are in the midst of a scandal unprecedented in American history, a subversion of the integrity of the presidency. It would be dangerous not to consider the possibility that the summit is less a negotiation between two heads of state than a meeting between a Russian-intelligence asset and his handler. The combination of [Trump’s] penchant for compromising behavior, a willingness to work closely with criminals, and a desire to protect aspects of his privacy makes him the ideal blackmail target. It is not difficult to imagine that Russia quickly had something on Trump, from either exploits during his 1987 visit or any subsequent embarrassing behavior KGB assets might have uncovered. But the other leverage Russia enjoyed over Trump for at least 15 years is indisputable — in fact, his family has admitted to it multiple times. After a series of financial reversals and his brazen abuse of bankruptcy laws, Trump found it impossible to borrow from American banks and grew heavily reliant on unconventional sources of capital. Russian cash proved his salvation. From 2003 to 2017, people from the former USSR made 86 all-cash purchases — a red flag of potential money laundering — of Trump properties, totaling $109 million. “We don’t rely on American banks. We have all the funding we need out of Russia,” boasted Eric Trump in 2014. Contrary to Trump’s recent efforts to depict his relationship with Manafort as distant and short-lived, the two continued to speak regularly even after the inauguration. We know this because U.S. investigators had convinced a FISA judge to wiretap Manafort’s phone. One way to make sense of his behavior is the possibility that Manafort is keeping his mouth shut because he’s afraid of being killed. That speculation might sound hyperbolic, but there is plenty of evidence to support it. Russia murders people routinely, at home and abroad. In the nine months after Trump’s election, nine Russian officials were murdered or died mysteriously. Trump barely puts much effort into predicting a clean bill of health anymore. He acts like a man with a great deal to hide: declining to testify, dangling pardons to keep witnesses from incriminating him, publicly chastising his attorney general for not quashing the whole investigation, and endorsing Russia’s preposterous claims that it had nothing to do with the election at all. 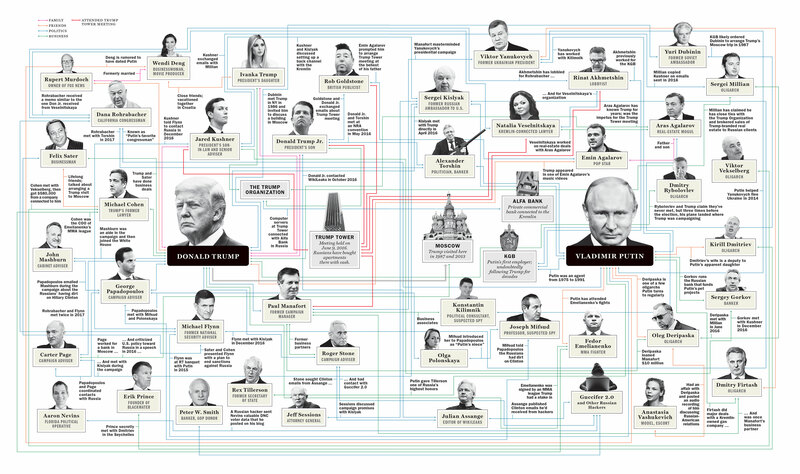 The full article can be read HERE, where the following “collusion chart” can be seen in more detail.